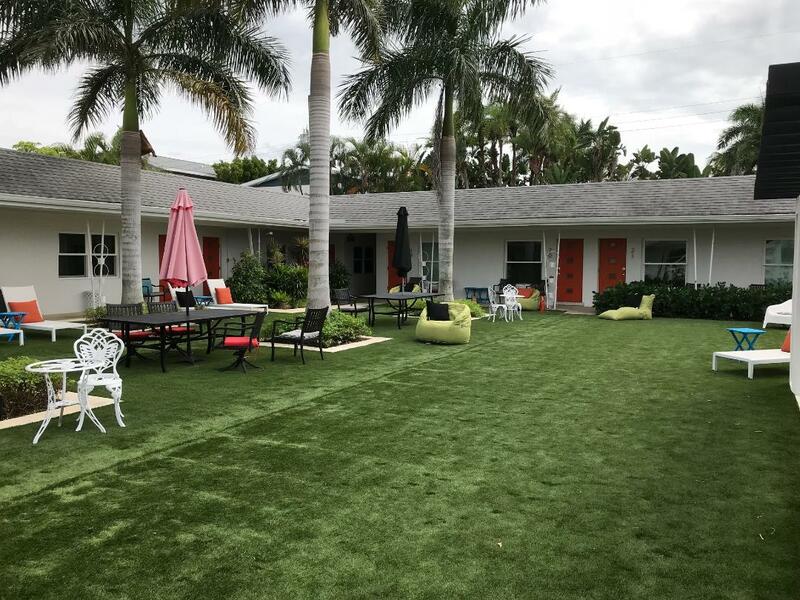 Recently we had a chance to get back to Siesta Key and stay at a little retro place called Captiva. Part of a group of lodging facilities on Sara Sea Circle, the facility has the feel of a 1950’s motel with all the creature comforts we need. Walking across the courtyard is your first hint. Where usually is grass, instead it is covered with a lush coat of astroturf. The plush fabric feels great between the toes and there’s no chance of sandspurs or ant hills to spoil the experience. Around the expanse of green are a variety of sitting areas. There are umbrella-covered tables, chaise lounges, even a number of beanbag chairs to add to the ambience. Our lodging was a three room suite with a kitchenette, a nice sized bathroom and a living area dominated by a king-sized bed. The bed was very comfortable, and situated in front of a large, flat screen TV. We never did turn it on, but it was there in case we needed it. There’s so much to do at Captiva we did not need electronics. The motels on the Sara Sea Circle share a wonderful pool area, which is ringed with palm trees and an array of natural flora – which both shields it for privacy and gives it a true tropical feel. For those who don’t actually want to get into the water, there’s plenty of seating on the brick deck around the pool so folks can lounge with their favorite beverage and soak up the sun. There were several folks leafing through local brochures to see what all there was to do in the area. Just down from the pool is a small shuffleboard court. By small, I mean there were only two lanes. As we strolled by there was a 30-something couple trying their hand at the sport (in training for their old age we presumed). However, the big attraction is the private beach area that is a hop, skip and a jump from our suite. More accurately, it was about a two minute walk, which wound down a brick pathway, then out into the sand. Along the way there were benches to sit and take off your shoes – and even a foot wash for when you were done in that beautiful sugar white, quartz sand. Walking through the sand there was an alcove lined by seagrapes and other vegetation. There are sand dunes for sitting, or you can walk out onto the wide expanse of hard beach that leads to the warm waters of the Gulf. It is a favorite place to gather in the evening to watch the sun go down. It was an amazing and diverse crowd. There were children running to and fro – one young girl was practicing cartwheels. Young lovers stood arm in arm silhouetted against the orange sunset and one woman in a long Hawaiian print dress emerged with a giant cocktail glass. There was even a guy sitting on the dunes playing his ukulele. “Is this Hawaii?” she asked. “No, this is Florida with a ukulele,” he responded. In addition to watching the sun go down, the beach is a great place to find a myriad of different shells and even some occasional driftwood. We brought home some of each. It’s also a great place to take a walk – but keep your eye on the time – it is easy to find yourself far down the way simply enjoying the sea breeze and the gentle sound of the waves. One of the nice things about Siesta Key, is that in addition to its own variety of restaurants and other eateries, it is close enough to Sarasota for a quick trip there. We began by going to Morton’s Gourmet Market to stock up for a quick breakfast inside the room. They have a wonderful deli, hot selections and an extensive bakery. We got everything we needed for a quiet breakfast together. For dinner, we visited Bob’s Train. Hidden in the back of an industrial park, it is a succession of railway cars with a circus theme. Old circus videos play at each end of the car, then there is a second car with the kitchen and a private dining area, and a third car set up for large gatherings. Bob himself comes out and talks about his work with the circus and a number of other activities in which he was involved. On our visit, he took us out back to see a new sculpture of an 1870s steam locomotive he is building from scrap. Still to come are a coal tender and an engineer. We really enjoy this area and have blogged in the past about the famous Sarasota Farmer’s Market, the “Unconditional Surrender” statue and other attractions – but stay tuned there are some other places we have yet to visit and we will be sharing them soon.